I should start this out by saying, I'm not a Kozue Amano fan. I've bought all of her books in the past, but they're some of the few art books that I've gone on to re-sell. 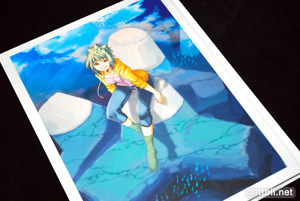 But while I don't like Aria, Crescent Noise or Roman Club, I do like Amanchu! So I decided to give her latest book, BIRTH Amano Kozue Illustration Works IV a try. The presentation is great as usual, it's hard cover, A4-sized and comes in a plastic sheath, like the other books, that has the title text printed on to it. 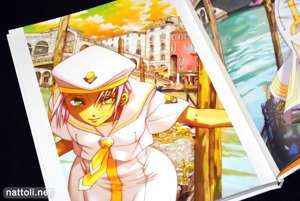 It's short for an art book with, 96-pages in total. The color portion of the art book ends on page 80. It's not printed with any page overlap, but there are several two-page spreads, so there are a few illustrations that get sucked into the page gutter. Interestingly, many (but not all) of the single full-page illustrations have larger white inner margins, so they aren't negatively affected by the tight hardcover binding. 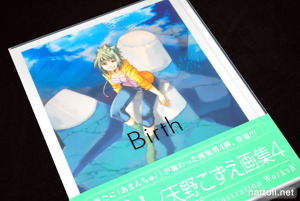 BIRTH starts out with illustrations from Aria, and it covers a total of 42 pages. 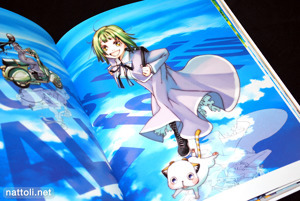 There are a few pages of chibi art works and zoomed-out architecture sceneries in this section. The next section is a mix of Roman Club, Crescent Noise and illustrations from short stories. 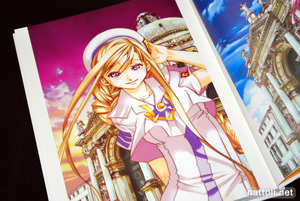 It covers a total of 12-pages, with 7-pages for Roman Club, which features the more scenic illustrations in the section. There are only 2-pages for Crescent Noise and it's two pages of the same exact illustration repeated for times in different hues. It's no Andy Warhol. 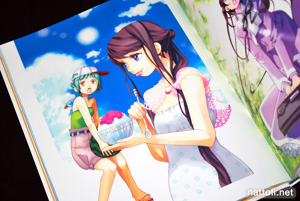 And finally to the section I bought it for ^^ The illustrations from Amanchu! run from pages 55 through 80 and are all in color. Though any fan of the series has seen all of the illustrations, it's nice to have them without text covering up the details. Many of the series art works from the past year were excluded, but all of the arts works that were older than a year are in the book. Aside from the cover illustration, I don't believe any of the other works are new. 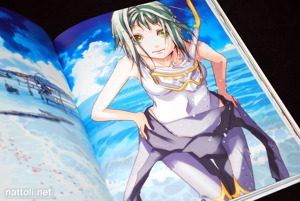 Looks like a lot of the Aria illustrations are from the manga cover artworks and her latest poster book. Although her reason is understandably, it's a shame Amanchu! 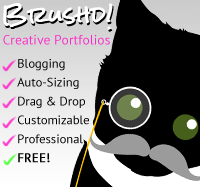 has been pushed to a three-monthly release. It's nice to see an actual review of the book out already. Even as a huge ARIA fan, it's always nice to have something else to mix things up a bit.